Pretty much any time I look around our home and think of updates that could be made, the total dollar amount instantly translates in my mind to plane tickets, travel accommodations, or adventure excursions. Don’t even get me started on the kitchen overhaul with a bottom line that basically equates to half of my dream trip to Antarctica. Functionally, everything in our house is in good shape and nothing truly needs replacing (knock on wood; 90s orange oak wood, to be specific). The basic builder-grade “finishes” throughout the house could stand to be upgraded though, so I’m thankful that a few easy and inexpensive fixes here and there make our little townhouse look a bit more updated without depleting our travel funds. Last year I gave our guest bathroom a mini makeover, and it was high time I applied those same tricks to the master bathroom upstairs. 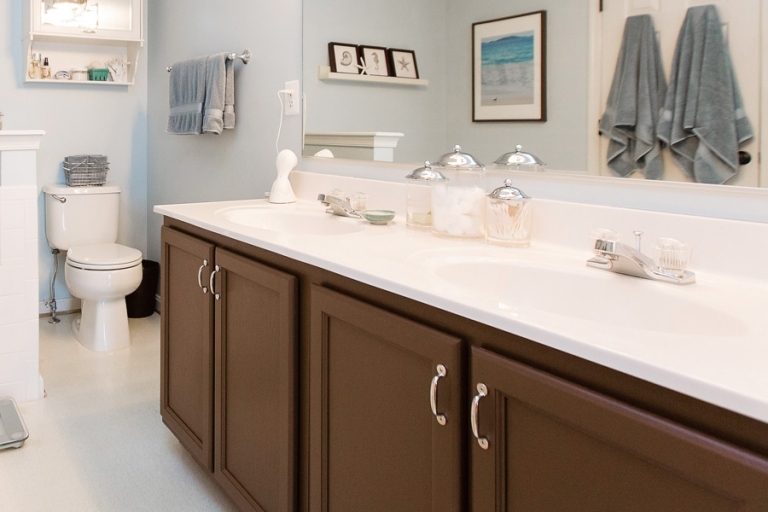 I started by replacing the bare-bulb vanity lighting with a fixture from Shades of Light. And based on the drywall disaster that we found when we replaced the light fixture in our guest bathroom (giant ragged hole in the wall behind the old fixture; took us eight hours to fix it), I hired an electrician for assistance with this one. 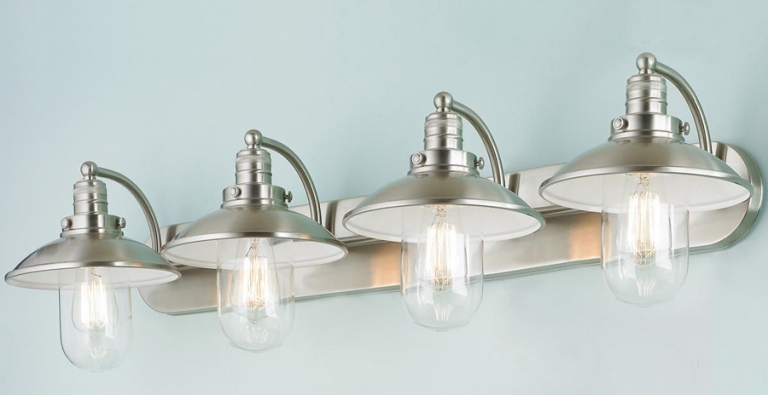 Good lighting is one of the areas I don’t mind spending money on because the quality seems to make such a huge difference, so I put the majority of our budget for this mini makeover into the Schooner Bath Light. It’s really difficult to photograph a light fixture in a room with no windows or without dragging out studio lighting equipment, so I’ll just show you the stock photo and call it a day. All I did was roll on a coat of Zissner primer, two coats of Sherwin-Williams Java, and then installed some hardware purchased at Pottery Barn. No crazy prep, no sanding, and pretty minimal dry time – I finished the whole project in a weekend. Ta da! Next up, I’m going to try to frame out that giant mirror, replace the faucets, and update the flooring (and I still need to paint the orange oak quarter-round near the baseboards). But for now I’m loving the difference the warm chocolate brown cabinet makes in the room. And of course I’m loving that the $30 in supplies didn’t eat into my Antarctica funds.